Although the American Folk Art Museum received a great deal of press attention upon the closing of its award-winning building on Fifty-Third Street last year, the really big story was to be found in its immediate resurgence. Beginning with the hugely successful red and white quilt show at the Park Avenue Armory and continuing with the world class exhibition Jubilation/Rumination at its Lincoln Square galleries, the museum has shown the energy and resilience of folk art itself, partnering with the South Street Seaport Museum, loaning material to the Metropolitan Museum of Art, and otherwise taking a healthy and diversified approach to its own shows. As its trustees continue their search for a new director we talked with them about the museum’s future. Fig. 1. Entrance to the American Folk Art Museum at 2 Lincoln Square in Manhattan. “I feel as if Laura was dealt a handful of deuces, while I got a handful of kings,” says Edward “Monty” Blanchard, the president of the board of the American Folk Art Museum. We are sitting in Laura Parsons’s light-filled downtown penthouse apartment, where clean-lined furnishings set off dramatic African art and dozens of paintings and sculptures by American self-taught artists-some small, others quite large, including a wonderful Noah’s Ark with a separate lifeboat for the skunks. Blanchard is being a bit modest in comparing the way in which Parsons guided the museum past the shoals of near financial collapse with his relative smooth sailing afterwards. He was, in fact, the “money man” on the board and had no small hand in keeping the museum afloat. But it is true that being president of the board now is much more fun. The hard decisions have been made, the budget is balanced, and the museum is moving ahead in ways that reflect its reputation for innovation (after all, it was the first museum to be devoted to folk art)-exploring exciting ways to present and share its collection and to move scholarship and appreciation of its particular bailiwicks-folk and outsider art-forward. Fig. 2. Installation view of the Jubilation/Rumination exhibition at the Lincoln Square galleries. Fig. 3. Blanchard and Parsons with a Noah’s Ark by William R. Jauquet (1945-), 1987, in Parsons’s collection. Photograph by Robert Essel. As her collection grew, so did her friendship with the Blanchards. Anne Blanchard was serving on the board of the Folk Art Museum and encouraged Parsons to become involved too. In 1997 the museum had expanded its mandate beyond traditional folk art to include the appreciation, study, and exhibition of the work of just the sort of artists Parsons was collecting- contemporary self-taught artists, particularly those identified with the field of outsider art, or art brut. Parsons enthusiastically accepted and joined the board in late 1999. The board’s biggest challenge at that point was convincing the museum’s audience and supporters that the mandate to include outsider art would better reflect the diversity of nonacademic American culture than traditional folk art alone. It took a little time, but, as Monty Blanchard (who took over his wife’s seat after her death in 2002 and became president last September) says, “People may still come to the museum for one, but they discover they can appreciate the other.” You only have to visit Jubilation/Rumination: Life, Real and Imagined, the provocative and thoughtful exhibition organized by senior curator Stacy C. Hollander to see how the two inform and enrich each other. Fig. 5. John F. Demeritt by Joseph H. Davis (active 1832-1837), New Hampshire, 1836. Watercolor, pencil, and ink on paper; 9 ¾ by 11 inches. Promised gift of Ralph Esmerian; photograph by John Bigelow Taylor. The show is the happy first realization of the directive to “get the art out there” issued by the board once the decision had been made to sell the Fifty-Third Street building and reinvent the museum in what had been a satellite branch at Lincoln Square. But the reduced footprint just means more dynamic exhibition planning and a slew of other creative ways to “get the art out there,” including long-term loans to other museums and special exhibitions in other New York locations. To wit: Compass: Folk Art in Four Directions at the South Street Seaport Museum (to October 7), organized in collaboration with the Museum of the City of New York, which operates the Seaport Museum. Hollander has selected an array of paintings and objects from the AFAM’s collection that illuminate the story of the seaport as the vibrant center of commerce and culture for New Yorkers and visitors from around the globe in the early nineteenth century. Fig. 6. The Apple Paring by Clementine Hunter (1886/87-1988), Natchitoches, Louisiana, c. 1945. Oil on paper, 12 ½ by 16 inches. Gift of Mildred Hart Bailey and the Clementine Hunter Art Trust. Fig. 7. Elizabeth Warren at home in her Shea Stadium seats with several of her other favorite things. Photograph by Gavin Ashworth. Fig. 8. Portrait of a sea captain attributed to Isaac Sheffield (1807-1845), probably New London, Connecticut, 1835-1840. Watercolor and metallic gold paint on ivory, 2 ¼ by 1 ¾ inches. Gift of Lillian and Jerry Grossman in memory of Joyce Hill; photograph by John Parnell. Folk-art collector Elizabeth V. Warren brings extensive expertise to the American Folk Art Museum’s board, where she has been a trustee since 2007. Beginning in 1984, when she joined the museum as its curator, Warren, now an independent scholar and consultant, has organized dozens of exhibitions on a broad range of folk-art topics. She is the author of seven books, including two on American quilts. Are you optimistic about the museum’s future? Very. It’s an exciting time. The museum is debt free and, in addition to working to build a solid financial foundation, the board is engaged in a formal search for a new director. We’ve also recently added several hardworking trustees. As a trustee, you stood with the museum through a tumultuous transition. Your thoughts? Being a trustee is certainly more work now than when I started in 2007 but it is also more rewarding. This is not a board that just shows up for meetings four times a year. We met weekly throughout the fall and have only recently relaxed the pace a little bit. It’s a great schedule. We will be hosting the traveling shows Artist & Visionary: William Matthew Prior Revealed and Bill Traylor: Drawings from the Collections of the High Museum of Art and the Montgomery Museum of Fine Arts. We are also organizing Foiled: Tinsel Art in America, which opens in September. Our Glitter Gala in the fall coincides with this exhibit and should be a lot of fun. Where can we see the museum’s collection? Our galleries at Lincoln Square are devoted to changing exhibitions, including the permanent collection. It is a wonderfully versatile space in a booming neighborhood. Programs like our Free Music Fridays bring in the community. Our popular Masterworks speakers’ series continues on Wednesday evenings through August 1. Compass: Folk Art in Four Directions, organized by our curator Stacy Hollander, is on view at South Street Seaport until October 7. We’ve also loaned fourteen major pieces to New York’s Metropolitan Museum of Art, where they can be seen in the American Wing. We hope to offer joint programming with the Met. What’s distinctive about the museum? 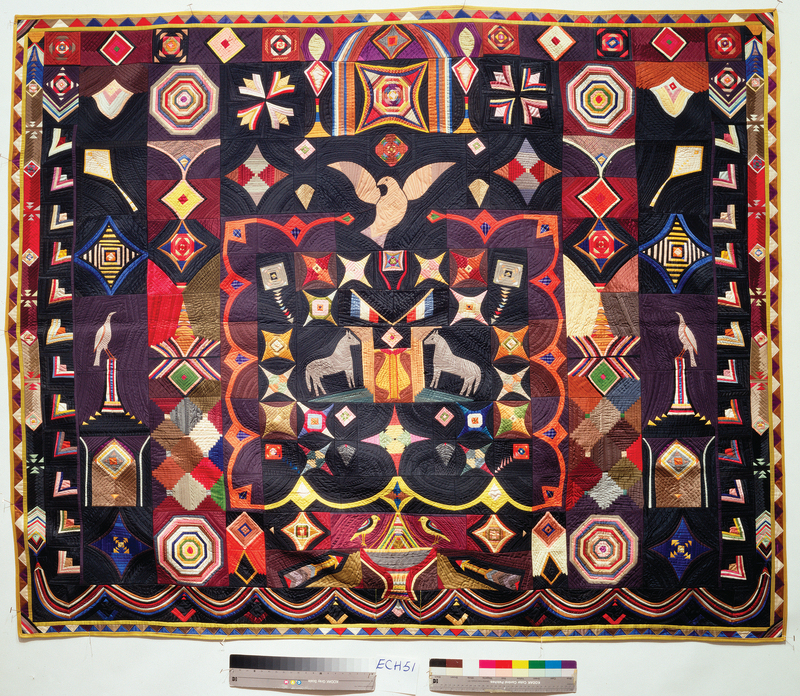 We are one of the few institutions to present folk art from the earliest days to the present. The spectrum makes us relevant and appealing to a broad audience. The field was in its infancy when the museum was founded in the 1960s. Now the field is mature. Is that a liability? The market for folk art may be mature but the scholarship isn’t. Work remains and much of it is being done by collectors, who have time and pas¬sion. There aren’t enough professional scholars in the field, mainly because so few people are teaching folk-art studies. The folk art world divides into two camps, traditional and contemporary. How do you reach both? The American Folk Art Museum tries to address all interests, including European art brut, which I think is a good attitude. So have you personally embraced graffiti as folk art? I don’t know if I would want to live with it but some museums are showing it and some contemporary collectors are interested in it. Novel things should be investigated. Material is getting scarcer and datelines have to be expanded. Traditional collectors may need to go well into the twentieth century now to find new material and contemporary col¬lectors certainly have to embrace the twenty-first century. My husband, Irwin, and I’ve collected traditional folk art since around 1980. Originally he liked modern abstract art and I liked antiques. We both loved Amish quilts. We bought two of them after a dealer sent photographs to House Beautiful, where I was working at the time. That’s how we started. Fig. 9. Sailing Ship Skulda, Course N. by East 15 by R. Johnson, Bronx, New York, c. 1960. Oil on window shade, 29 ½ by 43 inches. Gift of Herbert Waide Hemphill Jr.; Ashworth photograph. Tell us about the things in your photograph shown here. Elizabeth Yoder Stoltzfus made the Indiana Amish nine-patch quilt behind me around 1910. The early twentieth-century Indian clubs are a tribute to my great friend Alice Hoffman, who wrote the book on the subject. Early nineteenth-century miniature furniture, most of it painted and decorated, appeals to us because we are apartment dwellers. The Pennsylvania blanket chest of about 1830 is from the Snow Hill Nunnery. Pennsylvania folk art is a recent passion. Irwin, especially, is partial to fraktur. My father rooted for the New York Mets and I grew up a huge fan. For our anniversary a few years ago, Irwin bought me seats from Shea Stadium. He collects pre-WWII baseball cards and scorecards. I organized the exhibition and wrote the book The Perfect Game: America Looks at Baseball, so the seats are at home here. How has your approach to collecting changed? Collectors of my generation are doing what Irwin and I are doing, upgrading. That means that as we deaccession, there are opportunities for younger collectors to buy good things. My third quilt book: Infinite Variety: Three Centuries of Red and White Quilts. I’m exploring the possibility of traveling the exhibition, which was a huge success in New York last year. We had nearly twenty-five thousand visitors in six days. The excitement was like nothing I’d ever seen. Imagine The Gates, Christo’s site-specific installation in Central Park, moved indoors and composed of 651 red and white quilts! You’re a fixture at antiques week in New Hampshire in August. What will you be looking for this year? The best that we can afford. Fig. 10. Centaur weathervane probably by A. L. Jewell and Company, Waltham, Massachusetts, 1852-1867. Copper, gold leaf, and iron; height 50 ½, width 43, depth 29 inches. Gift of Ralph Esmerian; Taylor photograph.